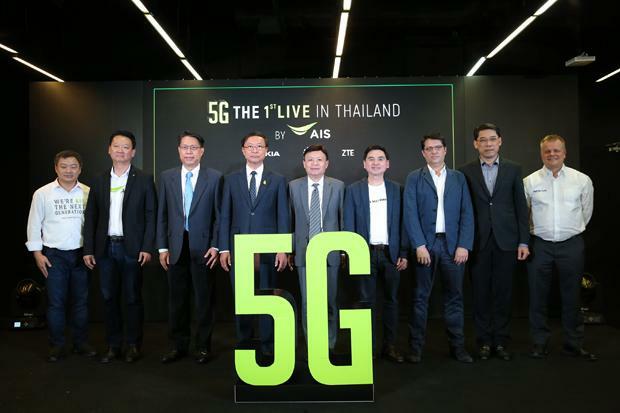 a] AIS has become the first mobile phone network operator in Thailand to commence 5G technology testing in Thailand, including making it available for trial at “5G the First LIVE in Thailand by AIS” in collaboration with global partners Nokia, Huawei and ZTE Corporation. “AIS is all about developing and providing the best digital infrastructure for Thailand,” explains Weerawat Kiattipongthaworn, Chief Corporate Officer. • 5G Super Speed showcasing the performance of the 5G network including total throughput and latency. • 5G Ultra Low Latency demonstrating the latency of 5G using three robots to find a balancing point that controls the position of a ball position in the middle of a board. The time difference to achieve balance between 4G and 5G technology will be clear. • 5G for Industry 4.0 demonstrating the role robots will play in Industry 4.0. The collaborative work of machines from various production lines requires wireless connection with low latency and high reliability. This speeds up production lines and makes them more flexible and efficient. Meanwhile, ABB’s Yumi Dual-Arm Collaborative Robot will demonstrate how connectivity through a 5G network can enhance production efficiency. • 5G Virtual Reality immersive video via 5G network enabling VR headsets so people can see what a 360° virtual reality experience is really like. Clear VR viewing requires the very high bandwidth that only 5G can provide, especially for live streaming. • 5G FIFA Virtual Reality will test 5G speed against virtual soccer penalty kicks. b] Thailand’s Digital Economy and Society (DE) Ministry plans to begin the trial for the 5G testbed in the Eastern Economic Corridor (EEC) in January 2019, according to the Bangkok Post which cites DE Minister Pichet Durongkaveroj. This move will prepare the country for 5G adoption by 2020. Initially focusing on transport, healthcare and tourism, the 5G trial will feature the recently announced alliance of private firms and state agencies, including Ericsson, Huawei Technologies, Qualcomm, Intel, Nokia, major telecom operators, the Thai Federation of ICT Technology Association, and the National Broadcasting and Telecommunications Commission (NBTC).The NBTC was asked to provide spectrum ranges for the 5G testbed in the EEC, particularly 3,500MHz and 26-28GHz. The alliance’s representatives are members of the working committee on the 5G testbed set up on Oct 31. The DE Ministry said it’s looking for potential 5G developers to cooperate in the 5G alliance’s trial. The 5G testbed’s lab in Sri Racha district is just 1.5 kilometres from Thailand’s first digital innovation park in Chon Buri province. The 5G sites and lab will be at the science faculty, Kasetsart University Sriracha Campus. The DE Ministry’s project runs in parallel with the NBTC’s 5G test centre in Bangkok under a partnership with Chulalongkorn University. 2. KT deploys 5G-based barista robot at Gangnam cafe – new use case for 5G? South Korean network operator KT (Korea Telecom) has applied 5G network technology to a barista robot at an unmanned cafe near Gangnam Station in southern Seoul, The Korea Times reports, citing a company statement. At the ‘Beat’ café operated by local coffee franchise dal.komm, a robot barista takes orders and serves customers drinks and coffee. KT installed a 5G mobile hotspot in the coffee shop so that the robot can receive 5G signals from base stations. “The 5G network in the cafe is used to send the status of the robot and high-quality CCTV to the control tower 24 hours a day”, said a KT representative. “With the CCTV equipped inside the robot, the robot also recognizes visitors to the coffee shop and sends video footage of the inside of the shop to the manager”, the KT representative added. “The 5G barista cafe is the world’s first 5G robot cafe to offer real 5G service”, said Park Hyun-jin, head of KT’s 5G business division. KT will also provide the robot with voice recognition and artificial intelligence (AI) capabilities. With these features, customers will be able to make voice orders and receive more customized service through the AI technology, KT added. Will 5G cause all the Starbucks baristas to lose their jobs? I think it will be robotics that might cause that rather than ANY new wireless technology. The 5G testbed lab in Sri Racha district is just 1.5 kilometres from Thailand’s first digital innovation park in Chon Buri province. The 5G sites and lab will be at the science faculty, Kasetsart University Sriracha Campus. Nothing in this KT marketing release has anything to do with 5G. The robot barista communications with the control tower could have just as easily been done with any reasonably high bandwidth wireless connection. We have certainly seen demos of robots and/or remote control R2D2 look alikes using much older generation WiFi.